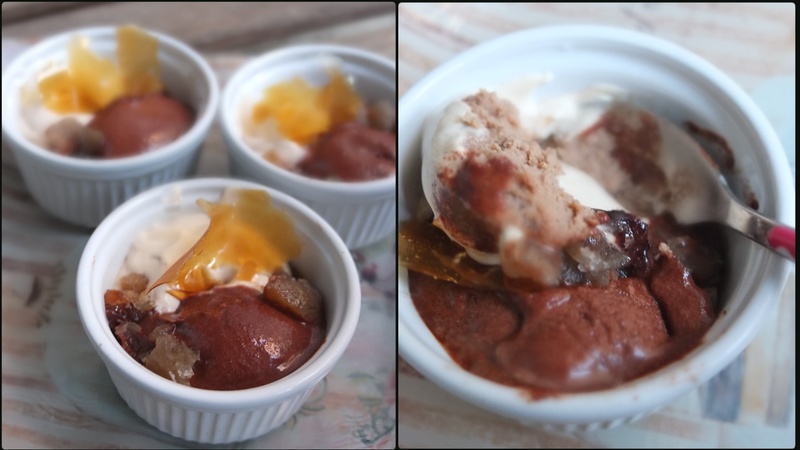 Unfortunately I suspect there are issues with the recipe, like the instructions to heat the tonka cream and sugar syrup for the sorbet to 180º celsius, which is too high and resulted in a pan of burnt stuff. I finally figured out 180ºC should probably be 180º fahrenheit so in the book this should be corrected to the equivalent 82ºC, which makes sense. 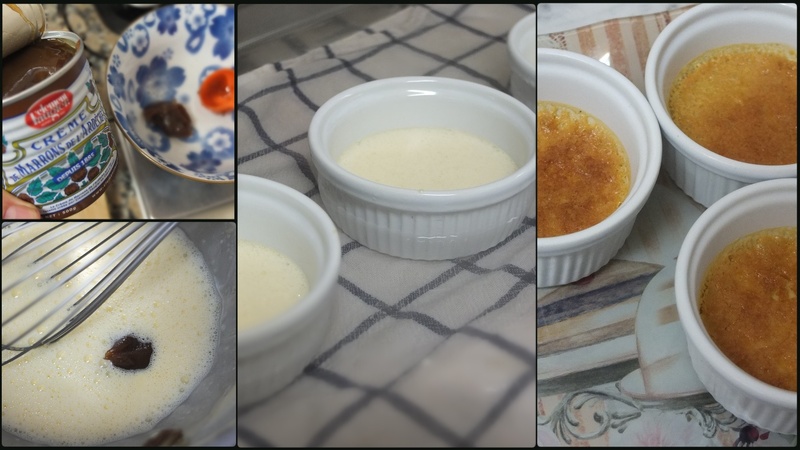 Then my first attempt at crème brulée had loads of chestnut purée (220g) compared to 30g yolks and 100ml cream (crazy huh?) so it was really dense. I did some research. 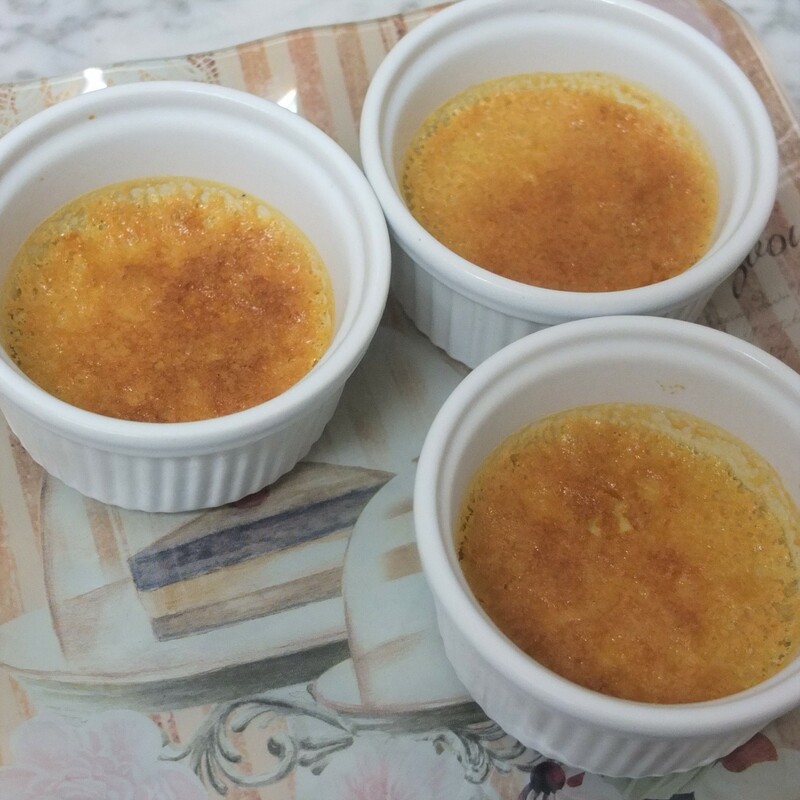 OMG – crème brulée is supposed to be creamy and light! Oops. Looking at similar recipes online it seemed maybe there should be 20g (not 220g) of chestnut purée – aargh. It’s a shame to lose faith in a cookbook and it’s the first time it’s happened to me. Anyway here’s the first heavier prototype, which was still yummy! 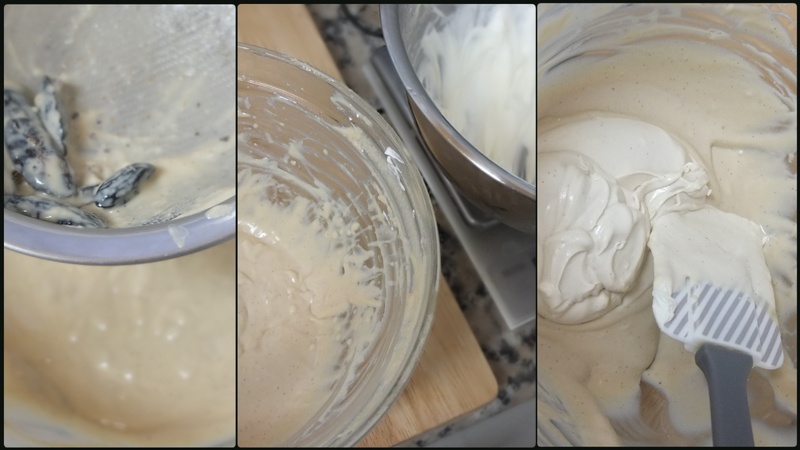 Prototype no.2 was creamier, also because I replaced the thick purée with a smoother chestnut spread. 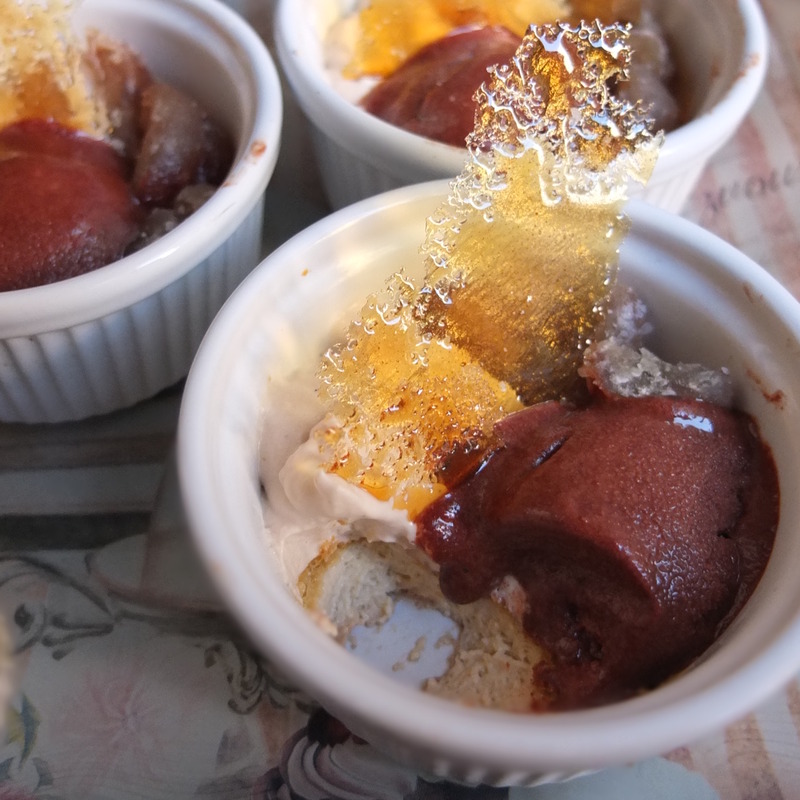 Then since there was no caramelised sugar on top in the original recipe I added shards learnt at a Michalak dessert workshop in Paris. They work great visually and in terms of texture and flavour! An ice-cream maker. 6 little heatproof pots. 1 deep baking tray where the pots can sit without touching. 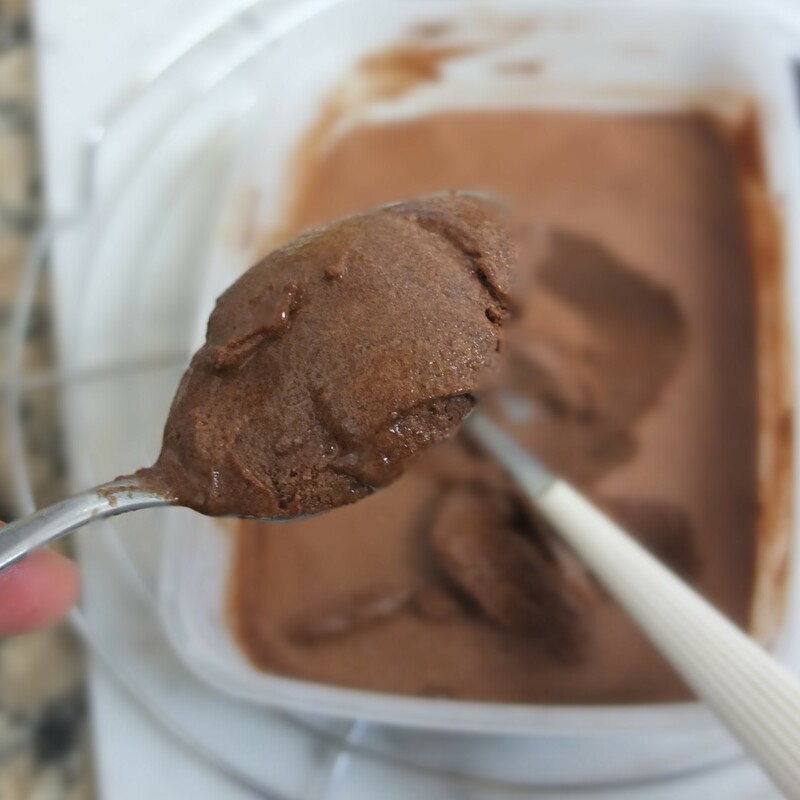 Make the previous day: chocolate sorbet (7 mins work + 30 mins cooling and 20-40 mins in the ice-cream maker); tonka cream (20 mins work + 30 mins cooling). 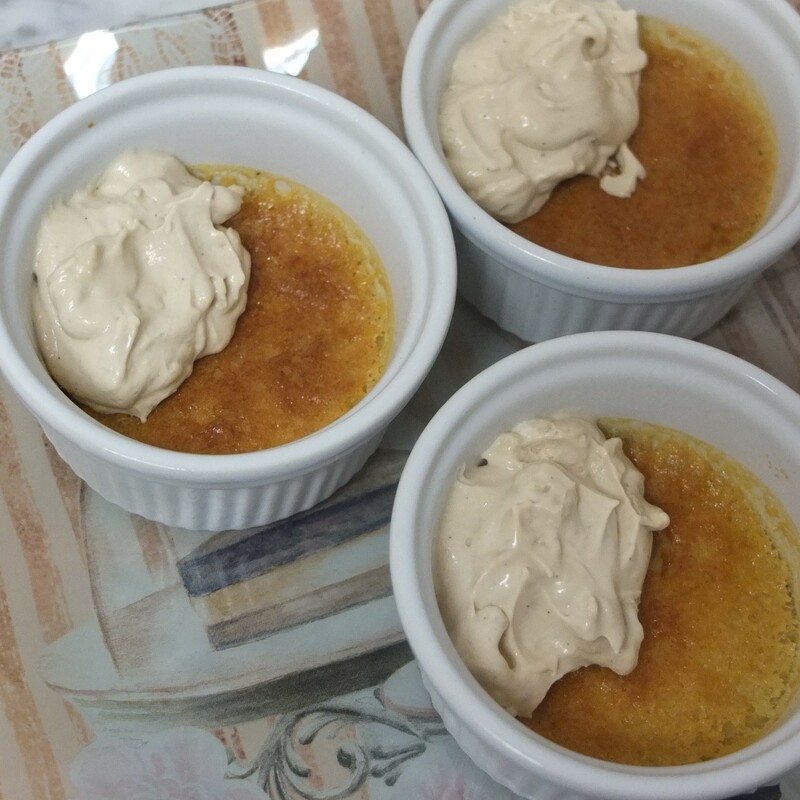 The crème brûlée can be made the previous day or at least 4 hours before serving on the day (10 mins work and 25-40 mins in the oven then 3 hours in the fridge). Total: about 50 minutes work. 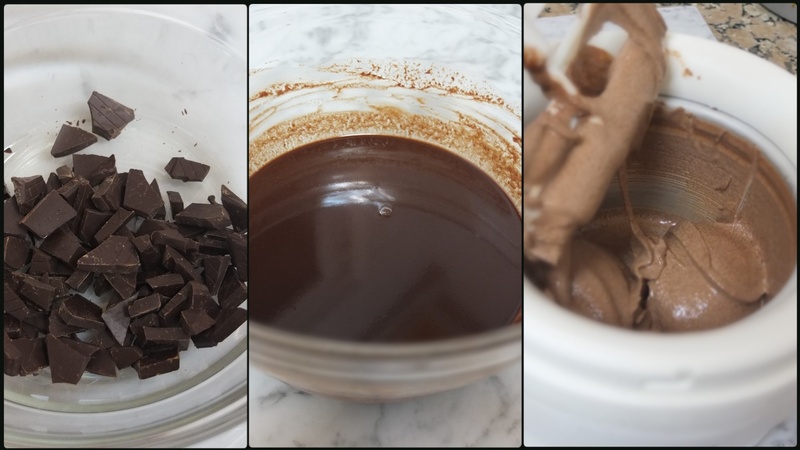 Break the chocolate up into small pieces in a medium glass or metal bowl. In a small heavy-based saucepan (on low-medium heat) heat the water, sugar and glucose to before simmering (82ºC/180ºF). Note: if the syrup is too hot it will affect the taste of the chocolate. Immediately pour the syrup onto the chocolate and stir slowly until combined. Allow to cool at room temperature then place in the fridge until completely cool. Churn in your ice-cream maker according to its instructions (in mine it takes around 30-40 minutes). Spoon into an airtight container and store in the freezer until needed. place a cotton tea towel on the bottom of a large deep baking tray (to protect the pots from heat) and place the pots in the tray so they don’t touch. boil a big pot of water ready for the hot water bath. pre-heat your oven to 180°C/350°F (static, non-convection oven) or 160°C/320°F (fan-assisted). 40g/2 tbsp chestnut spread (crème de marrons, like Clément Faugiere) – for a stronger chestnut flavour try 60-80g (3-4 tbsp). Whisk the yolk and sugar in a medium-large bowl to combine. Heat the cream, tonka bean and salt on low heat in a small saucepan until just boiling then take off heat. 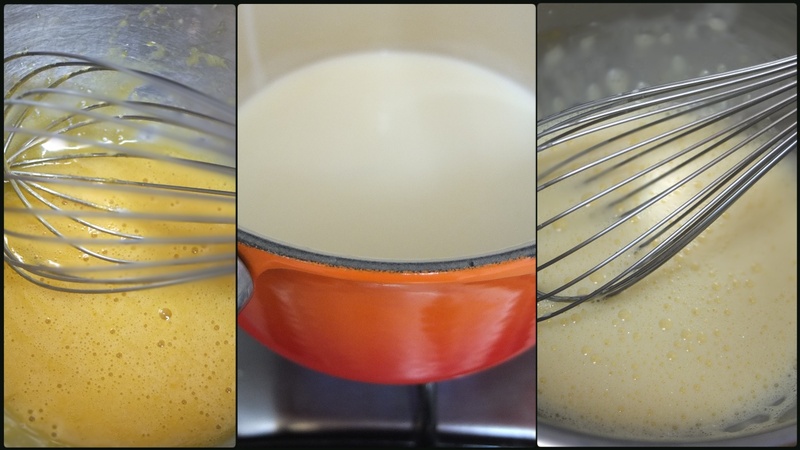 Pour the cream on the yolk/sugar and whisk to combine. 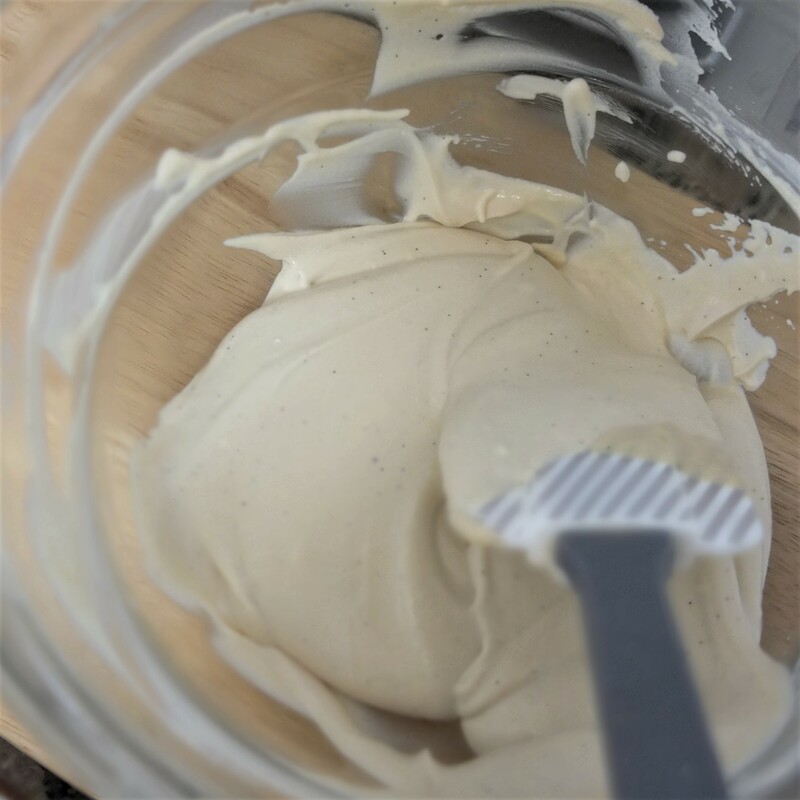 Whisk in the chestnut spread to combine then remove the tonka or vanilla bean. Carefully pour the hot water around the pots so it goes up to 1/2 to 2/3 of the way up the pot. Very carefully place in the oven and bake 20 to 40 minutes (it depends on your oven, mixture and pots). Check them after 20 minutes. If there’s a big wave when you jiggle one pot they’re not ready – it should just move and jiggle a little. Next time I’ll bake mine 20 minutes instead of 25 so they’re even creamier. And I’ll try covering them with aluminium foil when they bake. When ready take out and cool on a wire rack 30 minutes then in the fridge at least 3 hours before serving. About 30-60 minutes before serving pre-heat your oven to 180°C/350°F (static, non-convection oven) or 160°C/320°F (fan-assisted). Sieve several tablespoons caster sugar on a baking tray lined with baking paper. Bake in the oven 10-15 minutes until melted and medium golden brown. 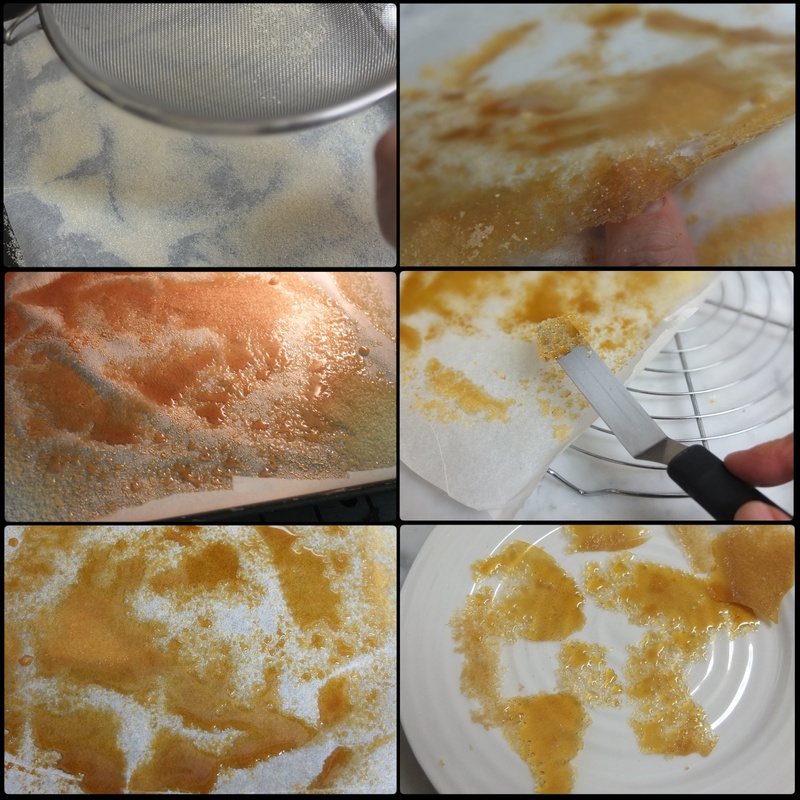 Note: if you spread the soft caramel out now to make it thinner it loses the airy bubbly look and becomes more solid as in my prototype 1. Keep an eye on it or it will burn. It will still look soft and liquid but take it out. Wait a few minutes so it starts to harden (careful, it’s really hot). Peel the paper off from under it or scrape shards off with a small offset spatula or butter knife. Place a little tonka cream on top to one side. 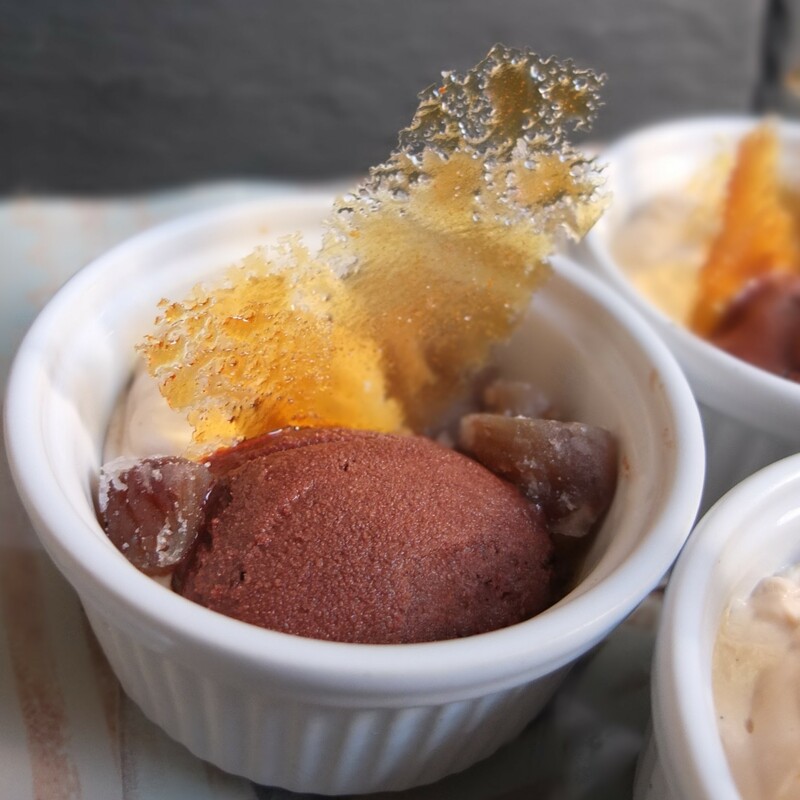 You could put all this dessert together in advance (except the sorbet) and it should keep up to a few days in the fridge. Yum yum! Now hide your tonka beans. Lol. What did this bean ever do to anyone?! 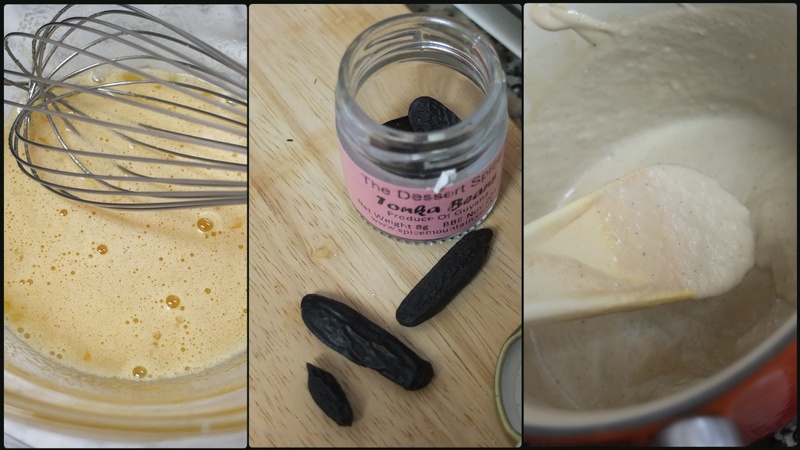 There are two great articles about this: The delicious flavour with a toxic secret on the BBC website and The tonka bean: an ingredient so good it has to be illegal. Yes, this bean can kill you if eaten in really large quantities!!!! But apparently it’s so amazingly delicious that in the United States chefs have ‘dealers’ who smuggle it into the country for them! 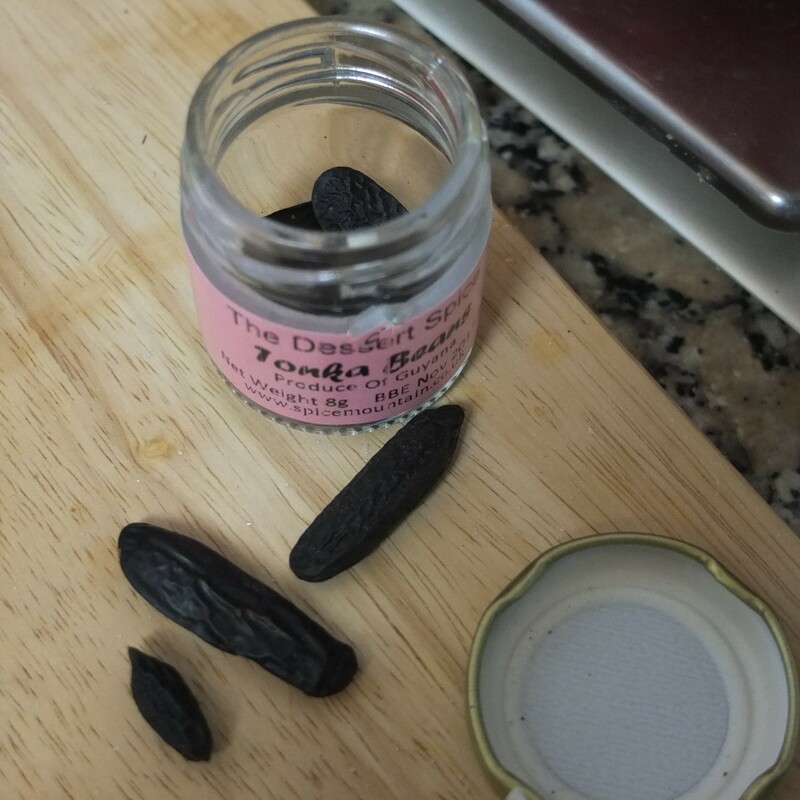 Naughty chefs but I can understand it – tonka beans have a truly wonderful flavour! Luckily here in Spain they’re legal so no cloak and dagger stuff for me. 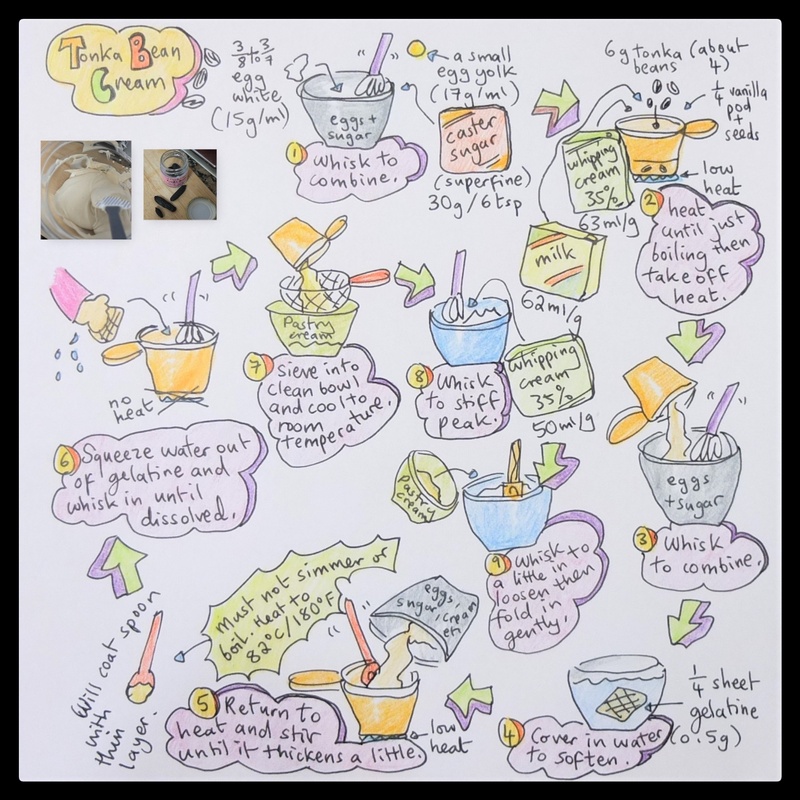 I’ll be grating a little into creams, cakes, chocolate creations … I’ve heard it can be quite overpowering so just a little. If you need help getting your own supply and you’re not in Paris, try le Meilleur du Chef, Amazon fr, Amazon uk or other online stores. If you can’t make it to Paris Mora has an online service (I’ve ordered from them before and everything came quickly in perfect condition). 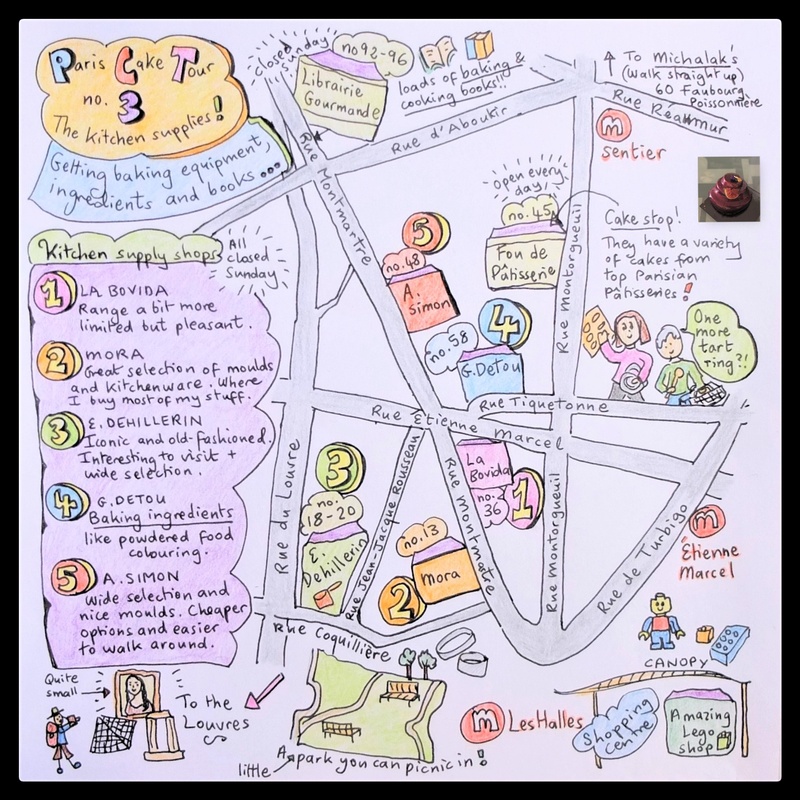 You can also buy the amazing Fou de Pâtisserie magazine online to make your own cakes! It’s great experimenting with new recipes and ingredients – trying out a celebrity chef’s creation has been really interesting! 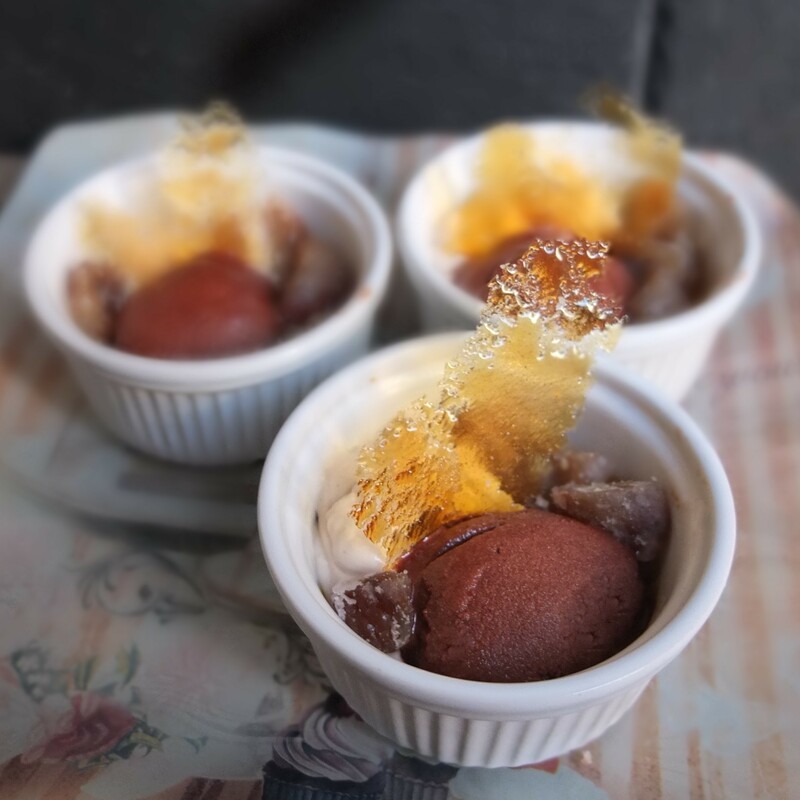 I’m so pleased to have followed Nobu Matsuhisa’s recipe because I discovered the wonderful complex flavours tonka beans bring to a dessert: hints of caramel, spice and vanilla! It’s amazing! 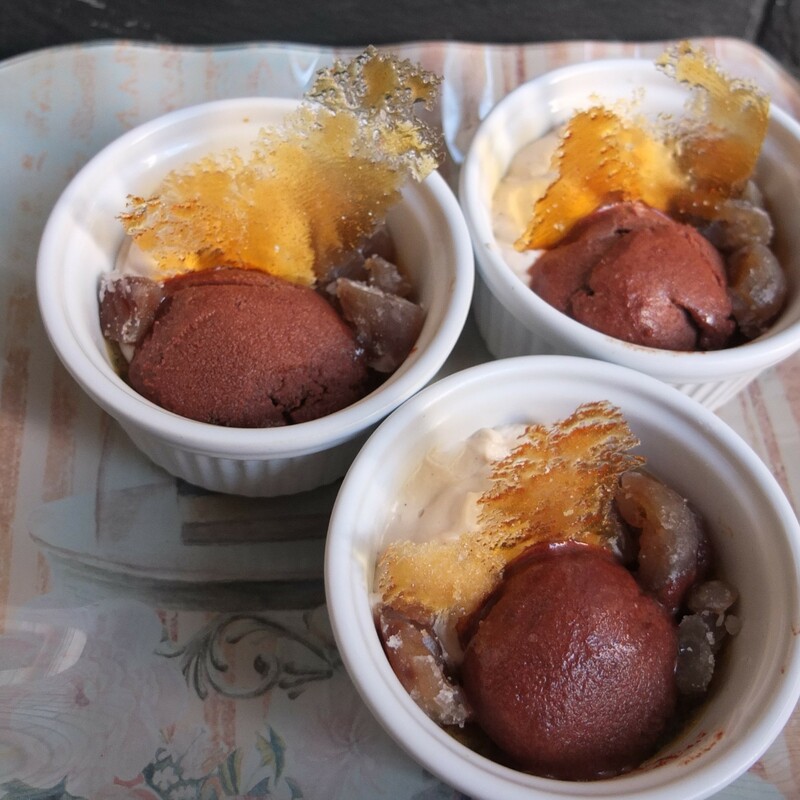 And the chocolate sorbet is so simple and yummy! Yay! So I’ll forgive the Nobu book for my little disasters. 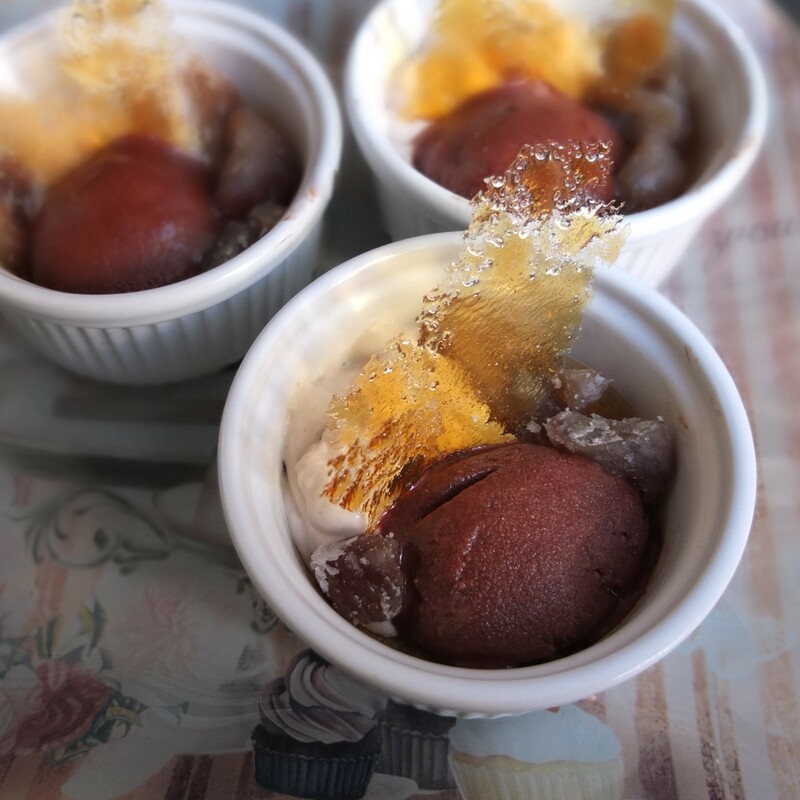 It was a learning experience out of my comfort zone trying new elements and ingredients to create an almost restaurant-style dessert. One thing I realised is I need to practise wiping serving pots clean so there aren’t any spots or drips. Luckily this doesn’t affect the taste. ostras que rico, te has atrevido con un platazo y lo has bordado! enhorabuena!! Oh no, I shouldn’t have seen this post in the middle of the night! Me wants this! !